A person who is not carrying the smart entry remote can unlock the trunk if a person who is carrying it is within range. 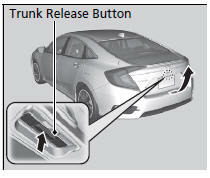 The smart entry remote may not operate if it is too close to the trunk. If you forget the remote inside, the beeper will sound and the trunk will not close. If the beeper sounds after you close the trunk, move the smart entry remote away from the trunk and close again.